It’s like the rich kid with all the latest toys who doesn’t have to try very hard to impress. 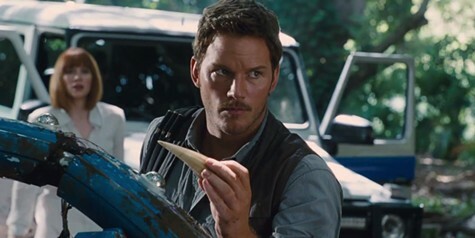 Chris Pratt stars in Jurassic World. Directed by Colin Trevorrow. With Chris Pratt and Bryce Dallas Howard. Now playing. Unfortunately it’s not the most stimulating S’berg project, either. There are absolutely no surprises in the screenplay, adapted from Michael Crichton’s original novel by a quartet of writers and directed by mumblecore veteran Colin Trevorrow (Safety Not Guaranteed). And the effects, while gaudy, are very much in line with other recent robot-superhero-monster spectacles. If Jurassic World had a personality, it would be the rich kid with all the latest toys who doesn’t have to try very hard to impress, and so gets by on that without challenging himself unnecessarily. It’s Christmas vacation. As a present from their parents, teenager Zach (Nick Robinson) and his little brother Gray (Ty Simpkins) take a trip to the notorious prehistoric theme park on an island off Costa Rica where they can get their fill of their favorite animals, dinosaurs — although Zach has evidently discovered girls, too. While there, the brothers also interact with their distracted, ultra-businesslike cousin Claire (Bryce Dallas Howard), who is Jurassic World’s chief of publicity, and dino trainer Owen (Chris Pratt), a rugged type who bonds with raptors as well with Claire. Meanwhile, there’s trouble in paradise: Jurassic’s owner Mr. Masrani (Irrfan Khan) is being warned by Owen and the park’s scientists that the newest attraction, a genetically modified hybrid dinosaur created to be the utmost in thrill-producing ferocity, is a bit hard to handle. Uh-oh. The hungry critters are not nearly as horrendous as the human greed and insensitivity on display. The company’s tag line is: “Bigger. Scarier. Cooler.” Corporate sponsors leer at jungle cruelty. À la the Roman Colosseum, the park’s customers are treated to grisly shows involving a staked goat and a hapless shark. MBA-jargon-spewing sharklet Claire has no time for her cousins until it’s almost too late. All the while, in addition to the usual Spielbergian pathetic fallacy (the raptors’ eyes, seen in the right light, look almost as beseeching as ET’s), the filmmakers “satirize” commercialism by loading on product placement. To pass the time, feel free to engage in the familiar disaster-movie game of guessing who will get chomped by the “assets,” and in what order. Leading candidates: short-sighted boss man Masrani, Claire’s chic but vacant assistant Zara (Katie McGrath), obnoxious military man Hoskins (Vincent D’Onofrio), and that nincompoop who falls into the raptor enclosure. In Jurassic World’s scheme of things they all deserve it. The “hamster ball” scene is exciting and well done, as is the pterodactyl attack on panicked park visitors. The film perhaps wisely decides against making fun of careless tourists getting mauled after coming too close to wild animals for selfies — probably a touchy subject for the movie’s intended juvie audience. Otherwise, the chaos just isn’t chaotic enough. It needs to be more unpredictable. The game is never for keeps — for example, as when during the life-or-death raptor-truck chase one of the brothers threatens to “tell mom” on his sibling. Would it ever occur to George Miller or Chris Nolan to have a character say anything like that? It happens every summer. In the midst of watching a movie like Jurassic World we imagine what it would look like if it were made by someone else. Say, Alejandro Jodorowsky, or the Kuchar Brothers, or John Waters. Of course they could never get Spielberg’s budget. Nobody ever said show business was easy.